My soon-to-be-16-year-old cousin and I watched this entire series in one sitting without really any breaks this past Sunday. We laughed, we were confused, we were screaming in frustration and praying that the characters we’ve come to like didn’t die. I have to say that even though this drama was a swiss cheese of plot holes and had some fairly mediocre acting at times, it really did capture our attention and get us involved with what was going on. Synopsis: …it’s really, really complicated, but…I guess basically it’s the battle of the clones. Who will be the last one standing? These people are killing each other for all the wrong reasons. What will they do when the find out the truth of their existence? So this all starts when Masamune Aoyagi (Ichikawa Tomohiro – his acting goes from lukewarm to okay to really good, but it mostly hovers at “meh” for me) decides to kill himself. 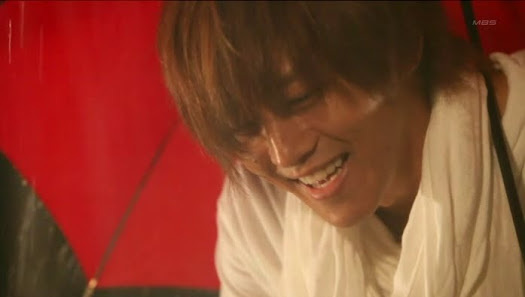 While on the rooftop of a building preparing to jump to his demise, a man dressed all in white approaches (Matsuzaka Tori as Kikuchi Hiro) and encourages him to kill himself as in this game of musical chairs, only one person will be left. Aoyagi doesn’t understand this at all and is shocked when he is pushed from the roof by Kikuchi. He then wakes in the hospital and things just get weird. This incident causes a chain reaction that leads to Aoyagi discovering that he and 10 other people are clones! And I tell you I was totally confused by this. To clone something is to have an exact replica. There would be no differences whatsoever between the copy and the original. The only thing these clones have in common is the asterisk birthmarks on their arms. 10 are male and 1 is female. How does that work? We don’t learn until the end of the drama that these clones are all unique because they had been altered slightly so as not to be exact replicas so they inherit the problems of the original. But then that in and of itself means that they cannot be true clones since they aren’t complete replicas…Right? It just means that one person was the sole basis for their creation, sort of like the master key. So I don’t know how they can have the exact same DNA still. This just does not seem logical. It turns out that Kikuchi is a clone and while he antagonizes Aoyagi and a few of the other clones, he really isn’t directly fighting. In fact, when it comes to clone #2 Gota [Kikuta Daisuke – the boy plays crazy well, and I mean well], Kikuchi does everything he can to stop his best friend from childhood from listening to the evil man and killing all the other clones. He wants to survive with Gota, but that doesn’t happen. Gota gets increasingly unstable and eventually snaps. He tries to kill Kikuchi and in their struggle, he ends up dead instead. Thus Kikuchi vows to destroy the one behind it all. Any two beings sharing the exact same DNA will duke it out until one is dead as there can exist no two people who are exactly same in this world. Well…I guess they have to make the show interesting. I have no idea if there was any real scientific basis where cloned animals really did fight to the death of one or both. It seems unlikely, but you never know. 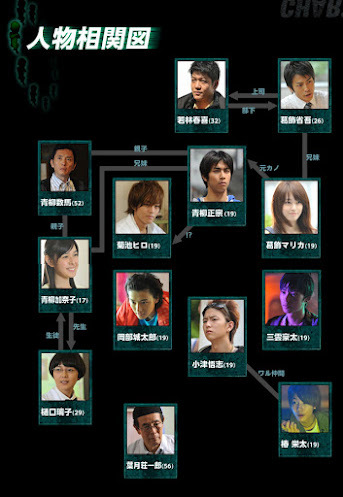 When Gota ends up dead, the Tanabata murder case is set as solved. All the clones were born on Tanabata (July 7th) of the same year. So this became known as a serial murder case when all these clones ended up dead with missing vital organs. In fact, one of the cops on the case, Katsushika Shyogo [Makita Tetsuya) happens to be the older brother of one of the clones (Marika played by Taki Yukari). He knows something is up and tries to get to the whole truth in spite of his partner Wakabayashi’s [Suruga Taro] insistence that it is all over. They had a heck of a time with the case since the assailant’s DNA was the same as the deceased’s. How is that possible. Clones. But then again, I still don’t see how their DNA could be an exact match since it was altered to make them each a little different. While events spiral out of control, Aoyagi bands together with fellow clone and ace hacker Jotaro [Yamazaki Kento who did an excellent job playing the crazy recluse who falls for the sassy Aoyagi Kanako], Higuchi, and his little sister to bring down the organization that created them. They learn that if they kill the master clone, then the clone’s inbred desire to kill each other could be restrained. The only problem is just who is the master clone. And just why were they created in the first place? Higuchi learns that Dr. Hazuki Shoichirou [Shiga Kataro] created the clones to save his daughter from a genetic disorder. He needs the clones organs to transplant into her. If it’s a genetic disorder, then wouldn’t replacing the organs do little good s the disorder will still exist? This plot really reeks of The Island starring Ewan MacGregor and Scarlet Johansen when they learn that they are clones created to use as spare parts for the originals. Marika ends up getting kidnapped as she is the only exact replica of Hazuki’s daughter. He doesn’t want to use her if he doesn’t have to and would rather just use Kikuchi, Aoyagi, and Jotaro instead [all the other clones have now been killed, including Gota’s replacement Ozu Satoshi played well by Inaba Yu]. I wondered why with 11 clones they needed to use ALL of the clones to save Hazuki’s daughter. Technically, only one clone’s organs should have been sufficient. We don’t learn exactly why this wasn’t possible, even when we learn the big secret in the very last episode. Of course, Jotaro sacrifices himself to save Kikuchi [who had been shot near the liver/kidney area earlier], Aoyagi, Higuchi, and Kanako. So that leaves only 3 clones. Dr. Hazuki is killed before he can reveal the true mastermind to Aoyagi. Kikuchi and Marika learn who the true mastermind is when Kikuchi goes to rescue Marika [who he is now supposedly in love with as she’s warm and caring]. Marika is let go as she is now exhibiting signs of the same cell failure as Hazuki’s daughter. Kikuchi urges Aoyagi to go and kill Hazuki’s daughter to save Marika’s life and to enable the restraint on their killer instinct [as Hazuki is the master clone]. 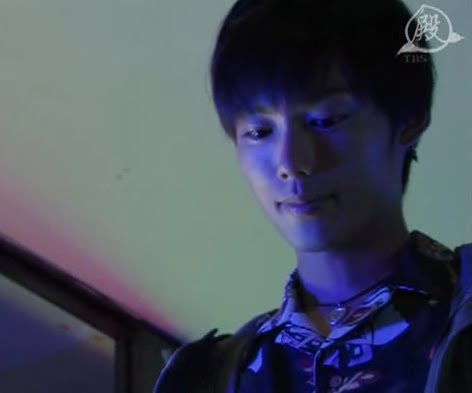 Aoyagi is reluctant, but he does eventually go as he can’t see Marika die. Kikuchi has a backup plan if Aoyagi fails. He’s near death’s door already thanks to his gunshot wound and he will gladly sacrifice his heart to save Marika [Aoyagi would have, too if given the chance]. 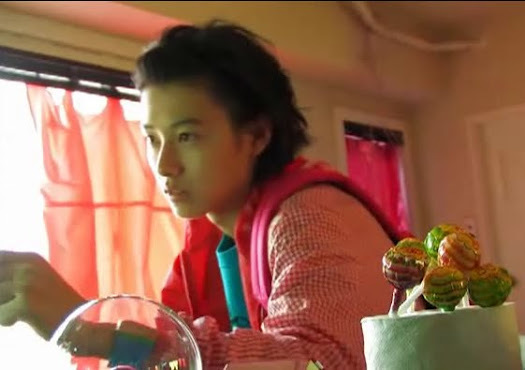 When he arrives, Aoyagi is stunned to find that Hazuki is exactly like Marika [DUH! Marika was the true replica]. Hazuki begs for death as she is burdened in knowing 9 lives [plus all the others caught in the crossfire] were sacrificed to save her. At this time Aoyagi Kazuma [Matsushige Yutaka – LOVE him, he’s a really great actor] enters the picture. It turns out that the Aoyagis’ father is behind it all! He did it for money and to prove it can be done and useful. Kazuma never planned on loving his adopted son to the point where he sacrificed one of the clones [we never meet this one as they are dead from the beginning of the series] in order to save Masamune’s life when he attempted suicide. Masamune is horrified to learn this. We end up with a standoff on the roof of the building where Masamune gets knifed by Hazuki in attempt to save his father [who had done the same thing earlier in the series when Gota tried to kill Masamune]. He then talks Hazuki out of killing herself as everyone has a rightful place in this world. And I must say how crappy it would be that all these people died just to save her and then she takes her own life. That’s just…wasteful? Meanwhile, both Kikuchi and Marika are in critical condition, but Marika magically survives without the needed heart transplant. Okay. I know that with science fiction and fantasy we have the willing suspension of disbelief, but come on! There are too many holes realistically. Given the height of the building that Masamune was pushed from, there is no way that just organ replacements [and an arm replacement] would have been enough. Masamune should have had lots of broken bones and severe brain trauma. So just replacing his arms and lungs, heart, etc., doesn’t seem like it would be enough, but that’s just me. Anywho, Marika and Aoyagi are back together again now that the nightmare is over. Um…yeah…even though their love is real…they are clones…and that is kind of just WRONG when you think about them having a relationship. Kikuchi has gone and Marika believes he’s doing all right. Yes, he is. We end with him returning and saying that there is only one chair in this game. WTF!!!!!!!!!!!!! Seriously? Seriously? What a rotten ending with no special, no second season, no movie…So open ended and I can’t get if Kikuchi will really go back to playing the game with the remaining 2 clones [what happened to Hazuki by the way?] or not. Sigh. So confusing. All and all, this wasn’t horribly bad. Matsuzaka’s acting is really what gave the drama that special verve. He was really good at playing the sociopath. Several actors did well [i.e. Yamazaki Kento, Inaba Yu, and Kikuta Daisuke] and a few did not so well [okay, mainly Ichikawa Tomohiro, he didn’t really come into his own I think until the very end of the series, but he has promise]. I think it didn’t help that the writers did not plan this series very well. The pacing was too fast and confusing from the get go and while this is a science fiction series, they seemed to ignore the SCIENCE part as a lot of things did not seem to be in the realm of possibility. One of the cool things about science fiction is that it shows us what is POSSIBLE given the right amount of time, technology, medical advances, and research. There were too many gaps in logic that jarred one out of the willing suspension of disbelief [ah, this brings back my college thesis…36 pages on conscious evolution in Frank Herbert’s Dune series]. The cool thing is what the drama is really about—human cloning and the rights of clones. Even though they were created with the sole purpose of being replacement parts, each clone had their own distinctive personalities and traits. While some clones were bad [Gota, Ozu, and Kikuchi at times] they were not inherently bad. Gota was a kind child who used to stand up for Kikuchi and get beaten for him. Ozu was a baseball prodigy who turned bully after his shoulder was injured. I really came to care for the bad seeds as well as the good ones. Particularly Jotaro who was just a whole lotta adorkableness. He seemed so much younger than the other clones we met even though they are all supposed to be 19. The Aoyagi siblings, Jotaro, and Higuchi were standing up saying that clones had rights to live their own lives and were people, too, not just copies that were easily created and just as easily disposed of when needed. If only this series had been more clearer, less disjointed and random. Some connections took awhile and personalities were not wholly explored. Like Kanoko’s dislike of Higuchi and her trying to blackmail the teacher. But still, this is definitely a series to give a gander to. Although now my cousin tells me she will never watch another Japanese drama again. She even threatened to kill me at the end of watching it as she was so dissatisfied with the ending. I was really sad that all those clones I came to care about died. WHY? It’s a like a Deep Blue Sea ending where only two people survive out of an entire group. Depressing. Since this series is 11 half hour episodes, its not a waste to sit down and plow through them and enjoy the eye candy and good acting that is Matsuzaka Tori. Oh…and the soundtrack is awesome. I do believe they used two songs by the group HURTS and I think they were both in English. Plus the awesome BGM music that added to the atmosphere. Some of the music reminded me of some famous movie score, but I can’t remember which one for the life of me right now. Maybe this was the drama that had the music that partially reminded me of Phantom of the Opera at times…then again, I can’t say for sure. This is really random, but where did you manage to watch “Clone Baby” on? It can be watched at DramaBuds.